A couple of years ago a found a recipe for a base risotto from Jamie Oliver’s book Jamie’s Kitchen. I made it once, and never had to refer back to it again it was that easy. I’ve tracked down the original recipe online here. 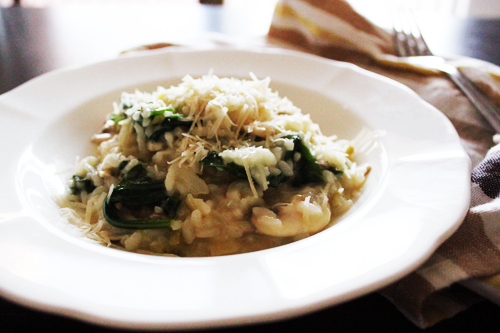 Give this a go if you’ve never made risotto before, it’s just so tasty and you will be sure to live on it during winter! Heat the stock in a pot or microwave. In a separate pot, heat the olive oil and 1 knob of butter, add the onions, garlic and celery, and fry on a low heat for about 15 minutes until the vegetables have softened. Turn the heat up and add the rice, stirring until all the rice is coated with the oil. Add the wine and keep stirring to cook out the alcohol. Once the wine has cooked into the rice, add your first ladle of hot stock and a pinch of salt. Turn down the heat to a simmer, and keep adding ladlefuls of stock, stirring the creamy starch out of the rice. Allow each ladleful to be absorbed before adding the next. Carry on adding stock until the rice is soft but with a slight bite. If you run out of stock before the rice is cooked, use boiling water. Remove from the heat and add 1 knob of butter, parmesan, mushrooms and spinach. Stir until the mushrooms become soft and the spinach has wilted down. Place the lid on the pot and let it sit for a couple of minutes to help the spinach. Serve immediately, topped with a good sprinkle of parmesan. Serves 4. I believe Jamie even does it as part of his 30 minute meals. Leish makes a nice risotto, I do really enjoy it! i cant believe you made this without me. its OUR dish. i feel like ive been cheated on. It wouldn't surprise me if he did, he is a lover of the Italian dishes! Sara I couldn't possibly have cheated on you, I made the serving of 4 for myself! However there were lots of yummy leftover bowls for lunch. I can recommend the roast pumpkin version of this recipe, always gets plenty of accolades! !